If you’re like me you like to spoil your clients every once and a while. I like to give out tiny gifts for Christmas, Valentines, birthdays, my business anniversary and new client gifts. Everyone likes getting gifts. My clients love the surprises and have even told me it adds to their loyalty to me. After being in the business for 10 years I have given out hundreds of gifts. I want to share with you some of the ideas I have used and some of the way I have saved money. I want to start with a few things I always keep on hand. You may already have some of these but most you can pick up in the city or if you are a one-stop shopper order online. A stack of business cards and discount cards. 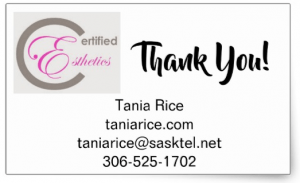 See my post here for more about how to use business cards and where to get them from. I purchase a bulk roll of ribbon in my business colours and keep that on hand at all times. I get mine from Gales wholesale in Regina, but you can check out any craft store or Amazon. 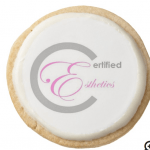 Also, you can have ribbon made with your business logo on it! I get this ribbon from Zazzle. I use this ribbon to wrap packages, attach gift cards to gifts and more. Stickers with your logo and business information are super important too. I used to order them from Vistaprint but I have found better quality through Zazzle. And if you keep your eye out Zazzle has quite a few sales so the price is comparable. Cellophane bags in assorted sizes come in handy. I also usually get these at Gales wholesale. 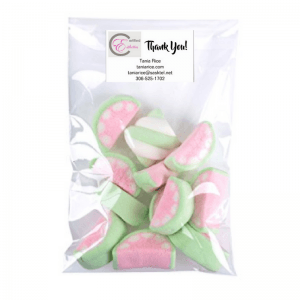 You can fill these bags with gifts, candies, snack mix, gum, cookies or just about anything. A quick search on Amazon came up with hundreds of options too. You can also get custom printed gift tags, custom printed tissue paper, and custom wrapping paper. 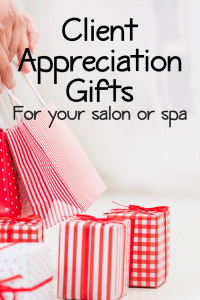 The actual client appreciation gifts ideas were probably the hardest to come up with. 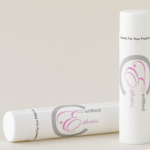 For the longest time I was picking up sample sizes at the beauty supplier’s but that quickly became costly. I do keep a few of the sample on hands but I only give them to clients with specific needs that I hope will actually purchase that retail item in the future. Check out local suppliers for more great discounts. They will probably have bulk items on sale a month or two before Christmas! Don’t forget to put your business stickers on each item so when your client pulls them out they are reminded that they are from you. If you would like to just give out a card you could try these ones from Zazzle. I give my clients 6. They can keep 2 and give out 5 to their friends. When their friends come in I ask them who gave them the card and then I give the original client an extra $10 off for every person who redeems the card. I have mine set at $10 but you can change that to reflect any price point. The least amount anyone has ever come in for is a $50 service. And you gain a new client! 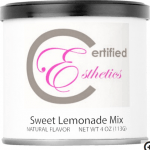 How cool is this lemonade mix with your logo on it! You can also order hot chocolate!. This would make a pretty neat retail item or donation gift! This is probably one of my favourites- Cake pops! 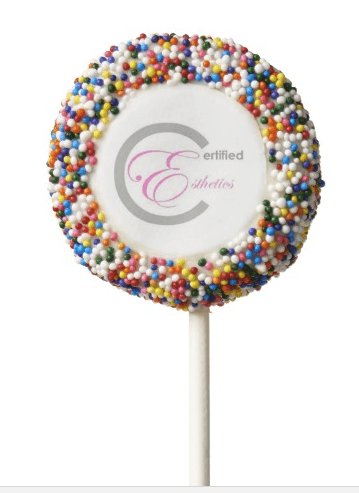 These custom Oreo® pops are covered in white or milk chocolate, adorned with the image of your choice and sprinkled in your choice of 5 colours.